Are you a part of the radish fan club or do you not care for them because of their peppery and at times, sharp taste? If you already like radishes I don't need to convince you, but if you are on the fence about this vegetable or even hate the way it tastes (gasp) here are a few facts that might sway your mind. The little red root vegetable is actually good for you! Yes, I know, I know, all vegetables are good for you, but these little guys are full of vitamin C, have cancer fighting properties and are low in calories to name a few. See, I thought this might peek your interest. My husband loves radishes as much as I do, however my kids are staunch radish opponents. When I try adding them to our salads, they always end up picking theirs out. They really don't know what they are missing out on ;-) One of my favorite ways to enjoy radishes growing up was adding thin slices of them on top of a piece of buttered rye bread, with just a tiny sprinkle of salt. Super simple, but so tasty. In fact, I get fairly nostalgic thinking about the beautiful red radishes from my mom's garden along with that wonderful baked bread that German bakeries are well known for. While radishes are available year round these days, I tend to think they are synonymous with spring. 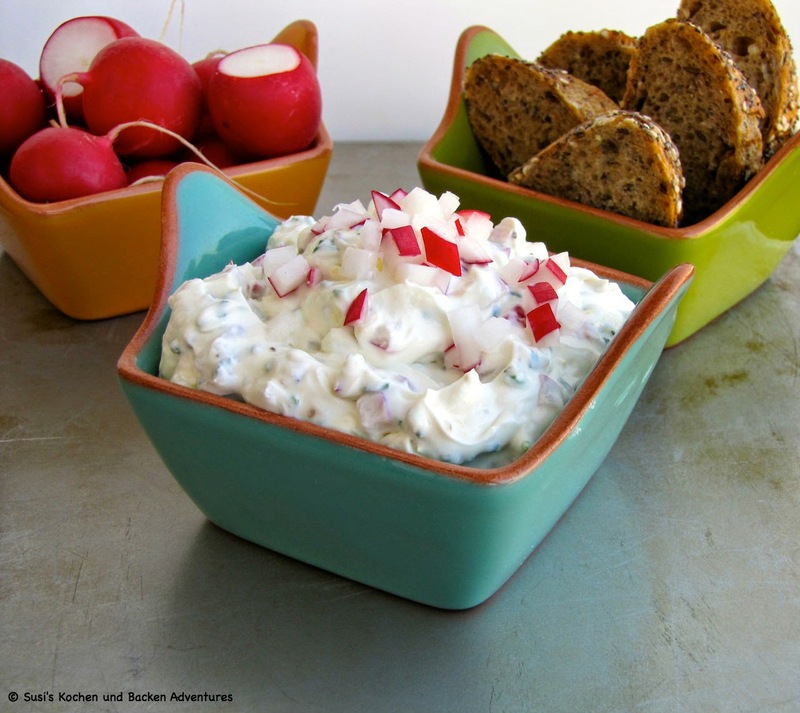 This easy to make radish cream cheese spread is the perfect appetizer or light lunch for the season. 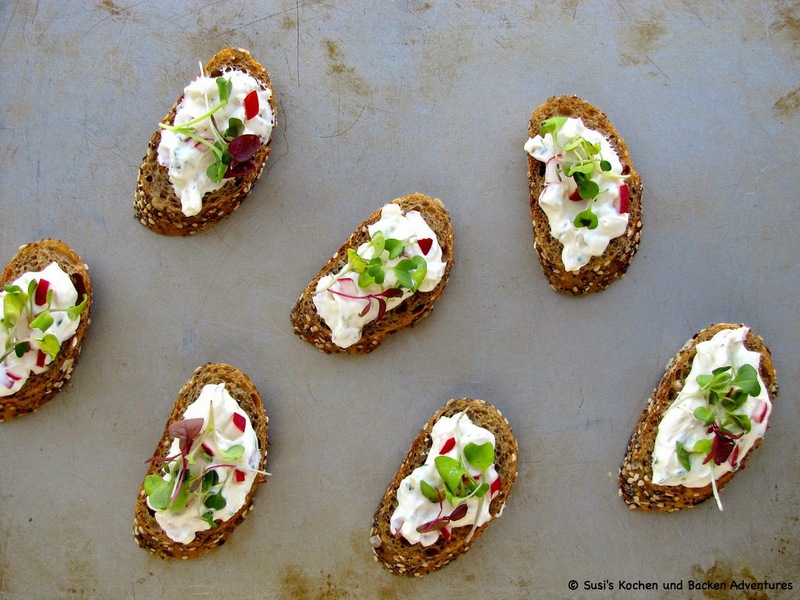 Cream cheese paired with plain yogurt, radishes, chives, lemon zest and lemon juice give this spread a light taste and make it irresistible. 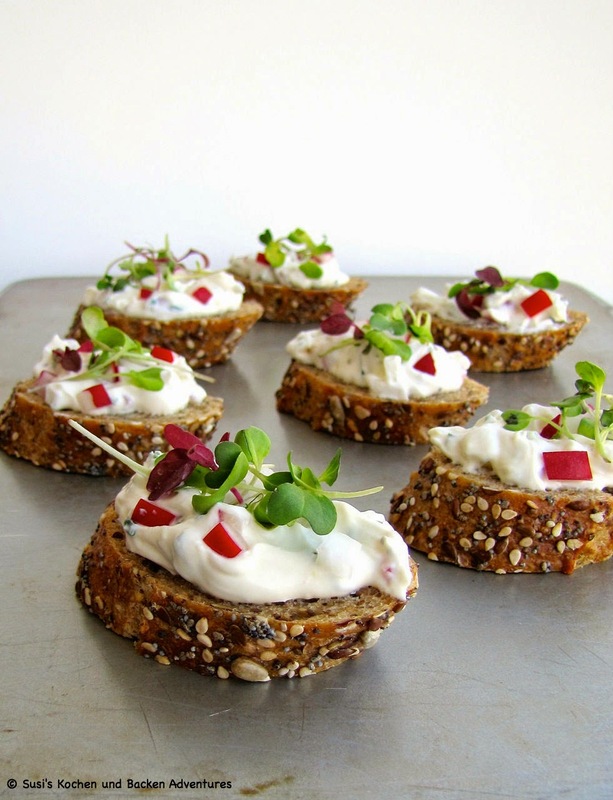 Add a dollop of the spread on top of a piece of seeded bread and sprinkle with some beautiful micro greens for added color. Arrange them on a platter and you now have the most perfect appetizer to serve for a spring luncheon or your Easter celebration. 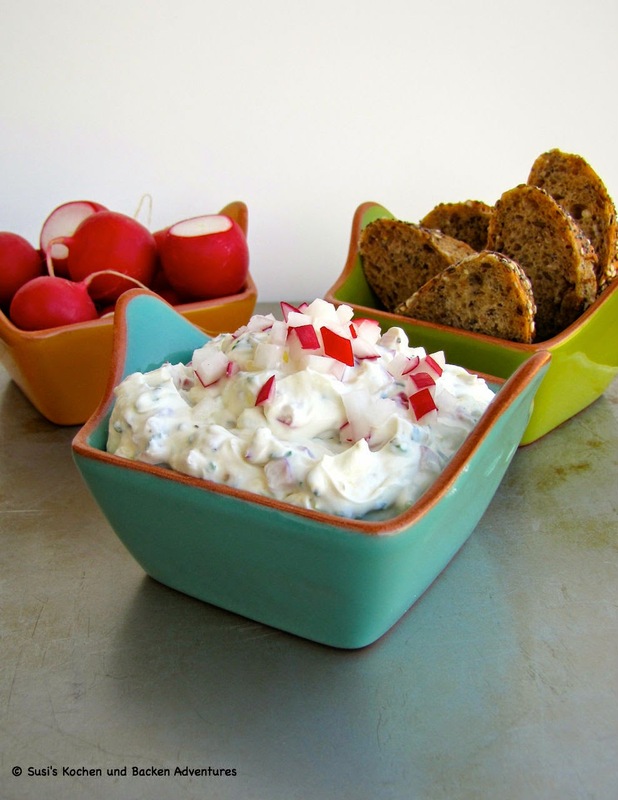 Oh, and for the record, everyone in my family enjoyed this radish cream cheese spread. Yes, even my radish haters! Place your washed and cubed radishes in a small bowl. Sprinkle with 1/4 tsp. Kosher salt and let sit for about 20 minutes to draw out excess moisture. In a medium bowl whisk together cream cheese, yogurt, chives, lemon zest, and lemon juice. Season with salt and pepper. Drain salted radishes well and fold into the prepared cream cheese mixture. Place mixture in the refrigerator for about 30 minutes before assembling. When ready to serve place a dollop of the radish cream cheese on your bread slices. Top with micro greens and serve. Notes: Drawing the moisture out of the radishes before adding them to the cream cheese is an important step that will prevent your spread from getting to watery after it sits. 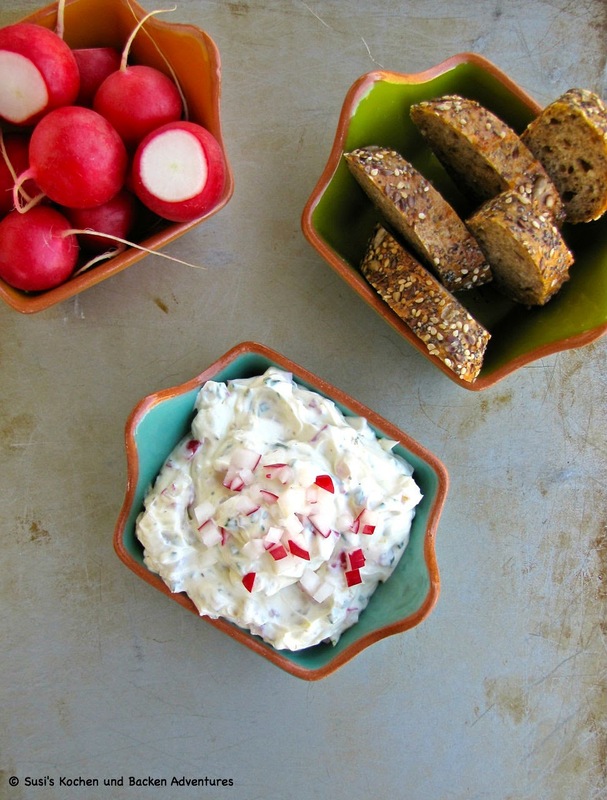 You can also serve this radish spread as a dip. In this case place the dip in a bowl and serve with bread, crackers and assorted vegetables, like carrots, bell peppers, and celery. For a change of pace, use the spread as a tasty bagel topping. The spread will keep in the refrigerator for a couple of days.